Prime Minister Ahmet Davutoğlu on Monday paid an official visit to the Philippines upon the invitation of Philippine President Benigno Aquino III and pledged that the country has Turkey's full support in its bid to end a decades-old armed conflict in the Muslim-majority south of the country as part of a peace process. In his visit, Davutoğlu showed Turkey's sensitivity toward the peace process in the Philippines as the Turkish government is trying to end its own decades-long conflict with the reconciliation process between Ankara and Kurds as part of the process that started with Justice and Development Party (AK Party) initiatives. 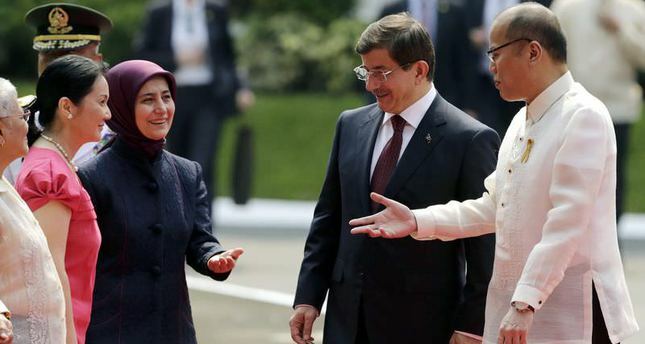 Davutoğlu said that he is pleased to see the peace plan in the Philippines yield: "A diplomat from Turkey has been in a significant mediator role [in the Philippines]. I believe that this success serves as a model." Davutoğlu noted that ambassador Haydar Berk, Turkey's former permanent representative to NATO, will focus on the disarmament of the Moro Islamic Liberation Front in line with the peace plan between the Philippine government and the Front, once the largest group fighting for greater autonomy in the southern Philippines. Berk has been appointed as chair of the Independent Decommissioning Body, including foreign experts to assist in the disarmament process. Turkey will take an active role in programming and building in the field of education, health and municipality of an autonomous region in the southern island of Mindanao to be called Bangsamoro. There are several countries in the Independent Decommissioning Body and International Disarmament Committee formed to end the conflict in the Philippines. In September, Aquino proposed to give Muslims in the south the ability to run their own government, part of a peace plan in order to end 40 years of conflict that has killed 150,000 people. Aquino submitted the draft legislation to congress to further a peace deal signed in March. The agreement between the government and the Front will create a new autonomous political entity called Bangsamoro that will replace the Autonomous Region in Muslim Mindanao. A committee member, Turkey-based Humanitarian Aid Foundation's (IHH) vice chair Hüseyin Oruç, said Turkey will contribute to setting up and running the autonomous government. Davutoğlu's visit is also regarded as significant as it is an opportunity to build a bridge between the two countries to increase diplomatic and bilateral ties. In a press conference held after the inter-committee meeting, Davutoğlu said, "[Turkey] saw the Philippines as a strategic partner and a friend. As a Western Asian country, strengthening relations with [South]east Asian countries is important to Turkey. Today, we are opening a new page." Aquino also thanked Turkey for its support for and guidance on the peace plan in the Philippines. Noting that the Philippine government sees Turkey as a significant partner, Aquino said that Ankara contributed to ensure peace on the archipelago. Touching on the regional issues in the Middle East, Davutoğlu said that there is a humanitarian tragedy in Syria, which has been living under civil war for years. "There is a humanitarian tragedy in Syria and nearly 2 million people crossed into Turkey due to the violence, destruction by the Syrian regime and due to the terrorist activities of ISIS [Islamic State of Iraq and al-Sham]," he said, adding that Turkey has called for a solution and regional stability on all international platforms. Davutoğlu is the first Turkish prime minister to pay an official visit to the Philippine archipelago and his visit marks the 65th anniversary of diplomatic relations between the countries.